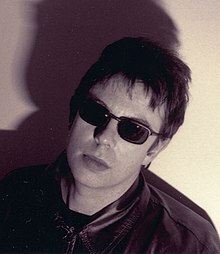 Ian Stephen McCulloch (born 5 May 1959 in Liverpool) is an English singer-songwriter and musician, best known as the frontman for the rock group Echo & the Bunnymen. McCulloch was a singer-songwriter with the Crucial Three, one of many local bands that sprung up amongst the regulars who patronised a Liverpool club called Eric's in the late '70s. The other two members were Julian Cope and Pete Wylie who went on to form Wah!. The band existed between May and June 1977, and never got beyond rehearsals. In July 1978, along with future members of The Teardrop Explodes – Cope, Mick Finkler and Paul Simpson – and drummer Dave Pickett, McCulloch formed A Shallow Madness. Again the band did not perform or record, but an acoustic version of the band, under the name 'Uh', played live twice. The band split up in September 1978. In October 1978, McCulloch founded Echo & the Bunnymen with Will Sergeant (guitar), Les Pattinson (bass), and a drum machine (allegedly named Echo), making their live début at Eric's in November that year. In October 1979 the Bunnymen exchanged the drum machine for Pete de Freitas on drums. With their line up solidified, the Bunnymen played in the late 1970s and early 1980s, releasing their critically praised, first two albums, the somewhat Doors influenced Crocodiles in 1980 and the heavier, bass driven, Heaven up Here in 1981. They released their third album 'Porcupine' in 1983 with the lead single 'The Cutter' finishing in the Top 10 of the UK Charts. Ocean Rain followed in 1984. Shortly before the album was released, McCulloch described "Ocean Rain" as "the greatest album ever made". McCulloch later said: "When I sing 'The Killing Moon' I know there isn't a band in the world who's got a song anywhere near that." 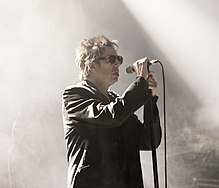 In 1988, McCulloch left the group to pursue a solo career under the impression the Bunnymen would be laid to rest, if only temporarily. When the remaining Bunnymen continued using the name with new singer Noel Burke, the split became permanent with McCulloch referring to the band as "Echo & the Bogusmen". In 1990, McCulloch released the album Candleland which reflected a more mature outlook on the world, owing to the recent deaths of McCulloch's father and Pete de Freitas, and peaked at number 18 in the UK Albums Chart. It yielded two Modern Rock Tracks hits, "Proud To Fall" (No. 1 for 4 weeks) and "Faith and Healing". The album Mysterio was released in 1992 as the public's interest in the former Bunnyman was waning and sold less than its predecessor. Shortly after, McCulloch left the public eye to devote more time to his family. In 1993, McCulloch partnered with Johnny Marr of the Smiths, writing an album's worth of material and generating public excitement over the collaboration of two highly regarded artists. McCulloch has credited Marr with helping him regain his lost confidence and rejuvenating his desire to create music. When it was suggested that Will Sergeant be brought in to work on the songs, the tapes were allegedly stolen from a courier van preventing Sergeant from offering any input. The rekindling of the relationship between McCulloch and Sergeant led to the formation of Electrafixion in 1994. The band released the album Burned which peaked at number 38 in the UK and included the top-30 hit "Sister Pain". The band soon found themselves performing set lists composed of half Electrafixion songs and half Echo & the Bunnymen songs. In 1997, Echo & the Bunnymen reformed and released the album Evergreen to positive reviews and chart success. Evergreen made the Top 10 of the UK Albums Chart and the single Nothing Lasts Forever reached No. 8 on the UK Singles Chart. The reformed Bunnymen have since several further albums, the most recent being Meteorites which was released in 2014. 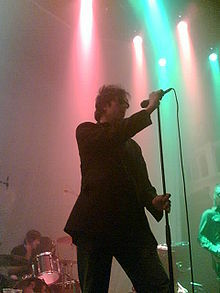 At the height of the Bunnymen's popularity, McCulloch earned the nickname "Mac the Mouth" due to a penchant for witty, blunt criticism of artists he deemed inferior, while proclaiming the Bunnymen's superiority. Targets of his observations included Bono of U2 and Julian Cope. More recently, in 2011, McCulloch said of Bono: "Had he been in Liverpool, he would have been laughed out of the place. U2 have never been liked in Liverpool. We know a fake when we see one." McCulloch said that during the early 1980s, Bono told him the Bunnymen could break America but only if they toured there for three months. McCulloch said: "Three months? I can't spent three minutes in Birkenhead without going daft, let alone America." In 1998, McCulloch teamed up with the Spice Girls, Tommy Scott of Space, and Simon Fowler of Ocean Colour Scene as "England United" to record "Top of the World", the official song for Team England in the 1998 FIFA World Cup, although it fared less well than a reissue of "Three Lions". He enjoyed more success working as a mentor for Coldplay during the recording of their 2002 album A Rush of Blood to the Head. In 2003, McCulloch released his third solo album Slideling and undertook a solo tour in support of the album. McCulloch has been a lifetime supporter of Liverpool F.C. In 2006 he took part in recording the team's anthem with the Bootroom Allstars – a remake of the Johnny Cash song, "Ring of Fire", and was on the judging panel for the music competition Pringles Unsung. In 2010, McCulloch featured in a guest role on the song "Some Kind of Nothingness" by the Manic Street Preachers from their tenth album Postcards from a Young Man. In 2012, McCulloch released a solo LP, "Pro Patria Mori" and a live album "Holy Ghosts" in 2013. McCulloch has cited Lou Reed, Iggy Pop, the Doors, Stevie Wonder, Leonard Cohen and particularly David Bowie as influences for his work. He has described Cohen's song "Suzanne" as "the perfect lyric with the perfect melody" and Bowie as "so influential and the greatest solo artist of the 20th Century in any walk of art." In 1983, McCulloch married Lorraine Fox. They have two daughters, Candy and Mimi. Candy appeared in the video for his solo single "Faith and Healing" when she was a young girl. The couple separated in late 2003. He was in a relationship with Zoe Devlin, a former X Factor contestant. They had a daughter, Dusty, but have now separated. McCulloch was brought up in the Norris Green area of Liverpool. The road on which he originally lived, Parthenon Drive, is the title of a song contained in the 2005 Echo & the Bunnymen album, Siberia. He was educated at Alsop High School. McCulloch featured in a YouTube video appeal in October 2010 which campaigned for Tom Hicks and George Gillett to be removed from Liverpool F.C. In a 2013 interview McCulloch said that he was no longer attending Liverpool matches. ^ "Ian McCulloch > Overview". Allmusic. Retrieved 1 June 2010. ^ Hutchinson, Charles (23 September 2011). "Echo & The Bunnymen, Grand Opera House, York.". Yorkpress.co.uk. Retrieved 5 January 2013. ^ Harrison, Andrew (12 April 2003). "This much I know: Ian McCulloch". The Guardian. London. Retrieved 5 January 2013. ^ "Paul Du Noyer interviews Echo & The Bunnymen". pauldunoyer.com. ^ "Bad Blood Is Only an Echo : With Electrafixion, Onetime Bunnymen Ian McCulloch and Will Sergeant Are Rockin' Again". latimes. ^ Stout, Andrew (2 December 2008). "Seven Lost Albums That Should Never Be Found". Seattle Weekly. ^ Power, Ed (23 September 2011). "Echo and the Bunnymen's Ian McCulloch lets rip". Irish Independent. Dublin. Retrieved 5 January 2013. ^ Dufour, Matt. "Members of Coldplay Join Ian McCulloch on New Solo Effort". The Fader. ^ "Talking Shop: Ian McCulloch". London: BBC News. 28 November 2006. Archived from the original on 11 January 2007. Retrieved 30 July 2016. ^ "Exclusive video: Manic Street Preachers feat Ian McCulloch – Some Kind of Nothingness". The Guardian. 2 November 2010. ^ "Ian McCulloch, Holy Ghosts/Pro Patria Mori". The Independent. London. 13 April 2013. Retrieved 3 November 2013. ^ "Ian McCulloch's cultural highlights". The Guardian. London. 7 April 2013. Retrieved 3 November 2013. ^ a b c "Mouth Of The Mersey: Ian McCulloch's Favourite Albums". The Quietus. ^ "Features | Baker's Dozen | Mouth Of The Mersey: Ian McCulloch's Favourite Albums". The Quietus. Retrieved 2017-01-02. ^ McCulloch, Ian (3 February 2002). "The perfect song". The Observer. London. Retrieved 6 April 2012. ^ Nissim, Mayer (21 April 2011). "Ian McCulloch seeks David Bowie hook-up". Digital Spy. Retrieved 6 April 2012. ^ Duerden, Nick (15 May 2014). "An echo of greatness: Echo and the Bunneymen return". The Independent. London. ^ "Heaven back here". Liverpool Echo. 28 November 2003. ^ "Ricky Tomlinson, John Bishop and Liverpool legend John Aldridge lay into Tom Hicks for YouTube protest video". Daily Mail (6 October 2010). Retrieved on 7 October 2010. ^ Simpson, Dave (11 April 2013). "Ian McCulloch: 'Car parks are a bigger threat than war'". The Guardian. London.